Q (7/92, p.105) - 4 Stars - Excellent - "...essential...one of the quintet's best albums...graced by such all-time great jazz compositions as `Footprints' and `Dolores'..." Down Beat (9/92, p.43) - 4.5 Stars - Very Good Plus - "...With a simpler, drier, more austere sound, the unrehearsed, rough MILES SMILES holds up so well simply because it was more of a jazz record...Davis' exquisite waltz, `Circle,' showcases his lyrical, muted-trumpet playing..." Musician (8/92, p.92) - "...has lost none of its cutting edge--still my favorite of the great quintet albums...Has any band ever grooved harder than Miles and company do on `Orbits,' `Dolores' or `Gingerbread Boy'--and has Miles ever penned a more touching ballad than `Circle'?..." Miles Davis Quintet: Miles Davis (trumpet); Wayne Shorter (tenor saxophone); Herbie Hancock (piano); Ron Carter (acoustic bass); Tony Williams (drums). Recorded at the Columbia 30th Street Studio, New York, New York on October 24 & 25, 1966. Originally released on Columbia (9401). Includes liner notes by Anthony Tuttle and Bob Belden. Digitally remastered using 20-bit technology by Mark Wilder and Rob Schwarz (Sony Music Studios, New York, New York). Miles Davis' restless curiosity would never allow him to look back, and as a result, he sought out new blood and fresh challenges over the course of six decades of innovation. When modernists such as Ornette Coleman, Cecil Taylor and John Coltrane began stretching the parameters of form and improvisation in the early '60s, Davis was leery, even hostile at first. But as the saying goes, if you can't beat 'em, join 'em--and by 1964 Miles had assembled his own dream team of innovative young turks, who began to vivisect the entire Davis book, before moving confidently into uncharted waters. 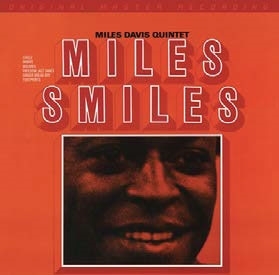 MILES SMILES marks a sea change in which the Miles Davis Quintet really begins to stretch out and confront the avant-garde with a modern thrust of their own--resulting in one of the greatest jazz recordings of all time. Performances such as "Orbits" and "Ginger Bread Boy" redefine all notions of swing, as Ron Carter and Tony Williams treat the beat in a free-flowing manner, superimposing new chords and meters over a fulminating 4/4 pulse. Pianist Hancock veers away from traditional block chord accompaniments, often providing spare polytonal counterpoint or laying out altogether. Tenor saxophonist Shorter's harmonic and melodic abandon inspire Davis to explore bold new vocal nuances in his phrasing, even as his classic compositions--such as "Footprints"--alter the harmonic language of jazz forever. And from the joyous hyper-funk of "Freedom Jazz Dance" to the serene misterioso of the trumpeter's remarkable ballad "Circles," MILES SMILES defines a new performance standard for collective improvisation.